Replace or Remodel: Which Option is Right For You? Blue Sky BuildersSkywriters Garage BlogGarage MaintenanceReplace or Remodel: Which Option Is Right for You? Many people set aside time each spring to work on home improvement projects. As the snow melts and temperatures become more tolerable, millions of families embark on remodels, renovations, and all sorts of other household projects. If garage repairs are on your to-do list this spring, you may be wondering how to best go about them. Should you tear down and rebuild a new garage, or is remodeling your existing garage the best option? Based on your needs, we will help you find the perfect plan of action for your garage repairs this spring. First, make a list of the changes you would like to accomplish this coming spring. Are you hoping to improve the look of your garage? Replacing things like garage doors and windows is fairly simple, and if the overall structure of your garage is still in good shape, remodeling is likely your best option. If, however, you find structural flaws on your garage, things like cracks in the walls or floor, tearing down and replacing your garage could be necessary. Examine your garage and make a list of all the necessary changes. Sagging walls, standing water within your garage, and cracks in your garage floor are all signs of a larger problem that might mean a new garage is needed. Homeowners are often too late noticing these problems, and once extensive damage has been done to the foundation of their garage, the best option is scrapping and starting over. Remodeling a garage on a bad foundation is costly and ineffective in the long run. The problems will just continue. Many homeowners run into issues with their garage roofs. Just like the rest of your home, the roof of your garage needs yearly maintenance. Without maintenance, shingles go missing, holes form, and leaking starts to happen. If you notice any of these problems, speak with a roofer about your options. If small repairs can do the job, rebuilding is not necessary. If more significant repairs are needed, ask your roofer about the costs. If roof repairs alone cost close to the costs of rebuilding a brand new structure, that may be your best option. If you find your list only contains aesthetic changes, remodeling is likely the best option for you. Doors and windows can be replaced easily and cost effectively. A fresh coat of paint can provide a much needed face lift to a dated garage. Many interior changes can be done affordably by garage contractors or even skilled homeowners themselves without requiring changes to the existing foundation. Hopefully by now you know what changes you hope to make this spring. The next step is setting your budget. 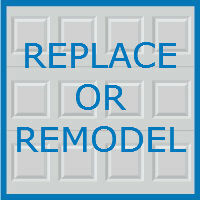 Is your garage the only thing on your spring to do list, or do you have other projects as well. Even DIY projects can become costly very quickly, so be sure to map out your budget. American homeowners report that serious garage remodels cost somewhere between $5,000 to $15,000 on average. Brand new garages, homeowners report, cost on average between $14,000 to $32,000. Of course, if minor repairs are all that is needed, you will likely spend much less, but these ballpark numbers might help you decide which option you can afford. Once you have mapped out what you can spend on your garage project, speak with a garage contractor to go over your plans. They will provide you with a variety of different options and you can choose one that fits your needs within your budget. The talented team at Blue Sky Builders is available to assist you with all of your garage related needs. If you are in the Chicago area, visit us online or speak to one of our garage experts to get started on your project. Contact Blue Sky Builders at (630) 852-8485 to get started today.